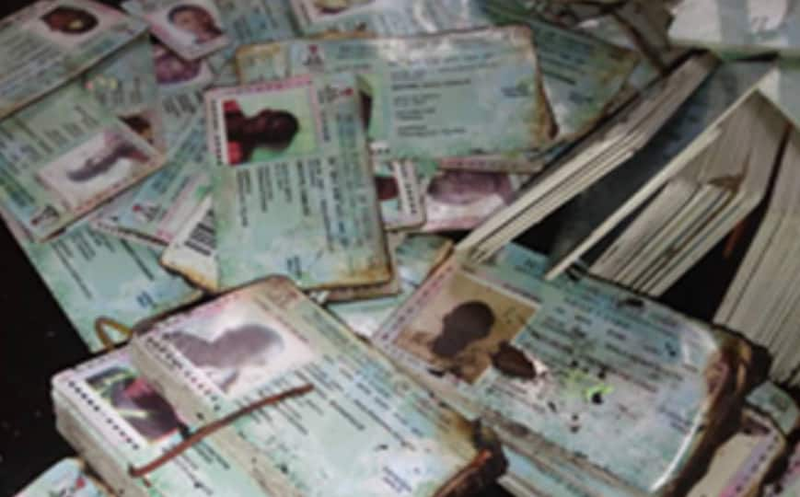 The Peoples Democratic Party (PDP) has demanded an independent probe to unravel the cause of fire which burnt two containers of smart card Readers meant for 2019 general elections in Anambra. The state chairman of PDP, Ndubuisi Nwobu, made the call in an interview with the News Agency of Nigeria (NAN) on Thursday, February 14, in Awka, the News Agency of Nigeria (NAN) reports. Nwobu said the Independent National Electoral Commission (INEC) as an independent body should tell Nigerians all they know about the fire incident. He said the fire could be taken as deliberate arson if INEC did not come up with the true story, adding that it had put the possibility of holding election on Feb. 16 at risk. The PDP chieftain expressed concerns over why the containers that had been serving INEC since 2011 could go up in flames four days to the crucial national elections. “To us as a party, it is pure sabotage, a deliberate act or arson, how can fire catch metal containers and all its content without explanation? “We demand that INEC tells Nigerians all it knows about the fire, let the commission get to the root of the cause of the inferno and punish those responsible,” he said. The PDP chairman alleged that the Anambra fire incident which had earlier burnt an INEC office in Abia was a calculated attempt to weaken the voting strength of people of the South-East region. Nwobu urged the Anambra electorate to remain strong willed and ever ready to vote for candidates of their choice during the elections. “According to him, he heard that INEC has given assurances that election will go on as scheduled but we wait to see how the electoral body will configure over 5, 700 smart cards in 48 hours. “We want to see the magic they want to perform but on our part, we are calling our teeming supporters not to be discouraged, they should be vigilant and every ready to exercise their right vote on Feb. 16 and March 2,” he said. Meanwhile, Nkwachukwu Orji, the INEC Resident Electoral Commissioner (REC) in Anambra has said that smart reader machines had started arriving from other states. Orji said the commission would have to double its effort to complete what took them three weeks in three days while assuring that elections would take place in Anambra as schedule. According to him 4,689 Smart Card Readers for 17 of the 21 local government Areas in Anambra were burnt by the fire. Earlier, Legit.ng reported that the. In a statement on Tuesday, February 12, the electoral body confirmed that this was the third fire incident happening in 12 days. INEC confirmed that 4695 smart card readers were destroyed in the fire incident although no lives were lost.